Inuvik, N.W.T. 's Anglican church hall becomes an emergency warming centre at night, where homeless people who have been drinking can find a place to come in from the cold. People in Inuvik, N.W.T. who need somewhere to sleep have a new place to go at night. The town's interagency committee has converted the Anglican church's hall into a wet shelter at night. Earlier this winter, the town's mayor approached the church's minister about using the church's hall as an emergency warming centre. Up to a dozen people, men and women, come in out of the cold every night for warm food and a safe place to sleep. 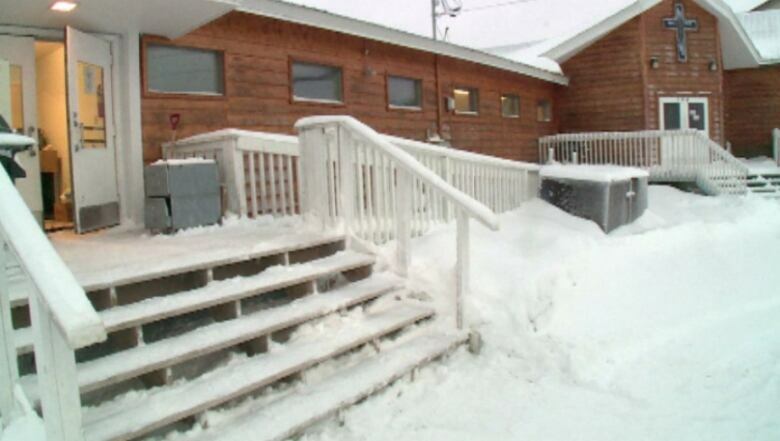 Volunteers turned Inuvik's Anglican church's hall into a wet shelter within a month. (CBC)It was up and running within a month. "It can get kinda chaotic for the first few hours, when people are coming in,” says Rev. Stephen Martin, the only full-time staff member. “They can get kinda edgy depending on what kinda mood they're in. But usually after they get some hot food in their stomach, and some tea and coffee, a movie or a TV program to watch, that’ll start calming things down." Up to a dozen people, men and women, come in out of the cold every night for warm food and a safe place to sleep. There's less privacy here than in Inuvik's homeless shelter, but people can't stay there after they've been drinking. Guests sleep on mats in the large tiled hall. Martin says many clients have family in town, but they may not be welcome there because of their struggle with addictions. "You talk to the folks here in town who are coming in, it's the community members here who have maybe just fallen through the cracks a bit too far,” Martin says. 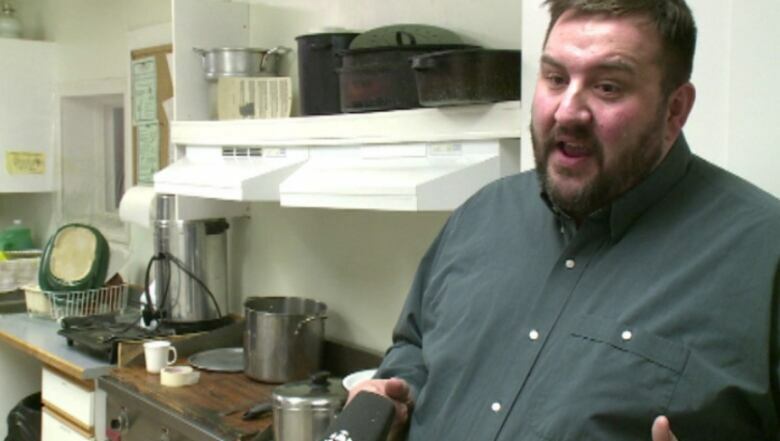 Matthew Clark, who manages the town's Northmart by day, volunteers evenings with the shelter. (CBC)The shelter relies on Martin, four part-time staffers and an army of volunteers. The RCMP dropped off thick sleeping mats, community members cook up chilis and soups, the hospital launders bedding and people have donated everything from cable to a big-screen TV. Matthew Clark is one of the many volunteers helping run the shelter. By day, he manages Inuvik's Northmart. He became concerned when he saw people camping out under the business. "As it got colder and colder, I became very aware that we have a problem, because no one wants to take someone that's frozen to death or somebody that's hurt because they're freezing and outside," Clark says. “We get the -30 weather and people living under buildings, it's pretty dangerous." Funding for the venture dries up on June 1. Both men are aware that a more permanent situation is needed. Clark says the town's inter-agency committee is looking at ways to deal with homelessness and addictions issues. “This is maybe a band-aid,” says Martin. “We gotta find better solutions, but for now, you are important to us, we care about your well being, your life and your safety."